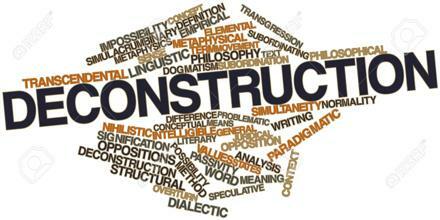 Deconstruction is a philosophical theory, which used in the study of literature or philosophy. It says that a piece of writing does not have just one meaning and that the meaning depends on the reader. It takes one into other aspects of meaning-construction, like phonetics, syntax, grammar,etc. It is a concept from the work of Martin Heidegger that Derrida sought to apply to textual reading. Deconstruction is a mode of reading that can be useful to point out the undecidabilities of any text, including the literary text.